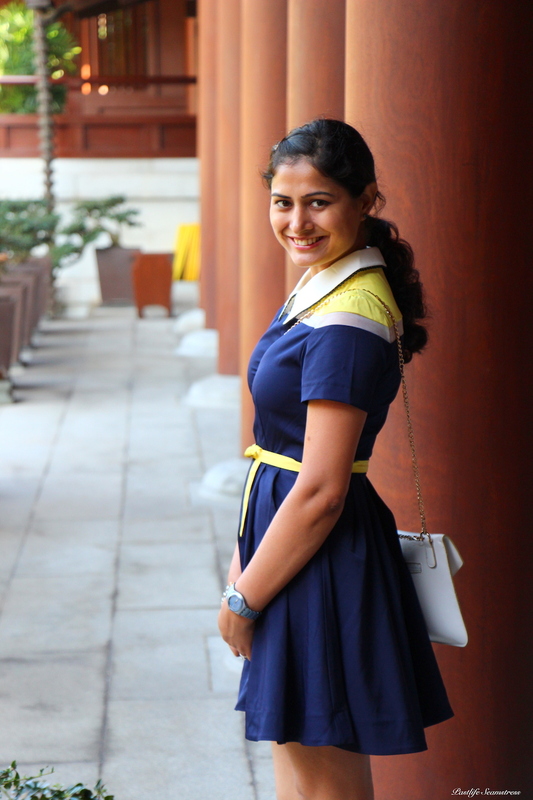 We found ourselves in Hong Kong  at the cusp of 2014-2015 on our way to Bali. I say found, because it wasn’t a ‘hand picked’ holiday destination but more of an ‘air ticket booking site’ picked destination that would connect us to Bali, Indonesia ultimately. Since we were going to do little else than eat, nap, swim in Bali, Hong Kong seemed like a good place to indulge in some retail therapy, fine-dining and to slide gradually into a new time zone so that we look less zombied – more alive when in Bali. And to simply feel the buzz of a pulsating metropolis, a sort of escapism from our usually uneventful and quiet life in this little hamlet we call home. So we thought why not Hong Kong?! 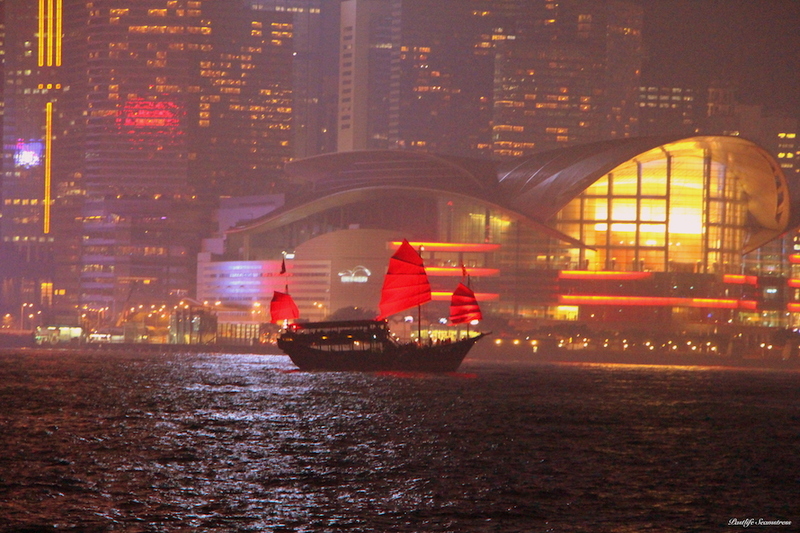 Pico Iyer described Hong Kong as ‘A dream of Manhattan arising from South China Sea’. However, I, for one was left a bit underwhelmed by it. But that’s just me . Nevertheless, we had some hearty meals and fun moments and good deals but all was tucked in that chest of memory that you don’t find yourself rummaging through often enough. It was only while reading ‘Crazy Rich Asians’ that I remembered I haven’t blogged about it. By hook or crook its finally in the book and here goes. 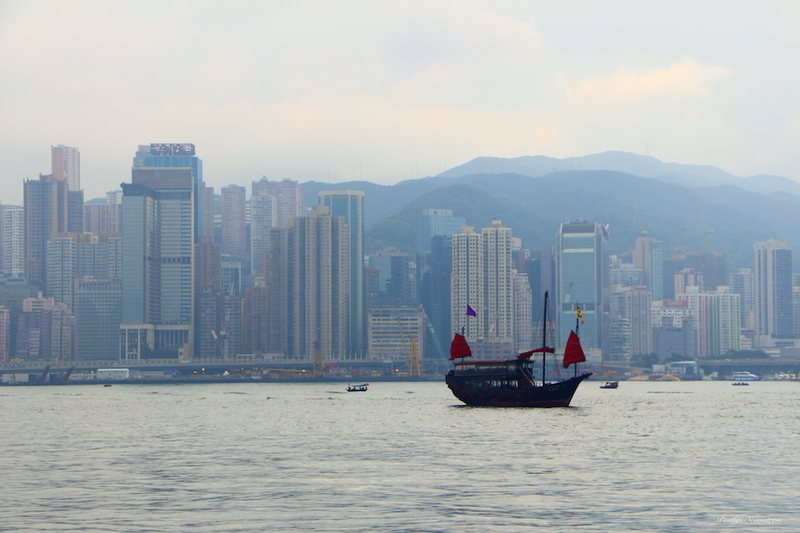 The Tsim Sha Tsui (bit of a tongue twister, yes? ) promenade offers the iconic panoramic view of Victoria Harbour and Hong Kong skyline made of sleek high-rises standing against misty layers of hills in the backdrop. A walk along the promenade is something tourists and locals enjoy alike. By nightfall the skyscrapers are all lit up and jazzy and a show of light and sound called ‘Symphony of lights’ comes to life. Show starts at 8pm, lasts ten mins, everyday of the week. It is also ‘the’ place to watch the fireworks on Chinese New Years’ eve. Views of Victoria Harbour from Tsim Sha Tsui promenade which makes for a lovely stroll or perhaps ride the junk (as is the ancient boat called) if you fancy. Unfortunately for us, there wasn’t any sun that day and it remained cloudy both – in our (jet lagged) head and outside. Contrary to expectations, the wide and clean Tsim Sha Tsui promenade was a lovely place to be – night or day, devoid of any large crowds. 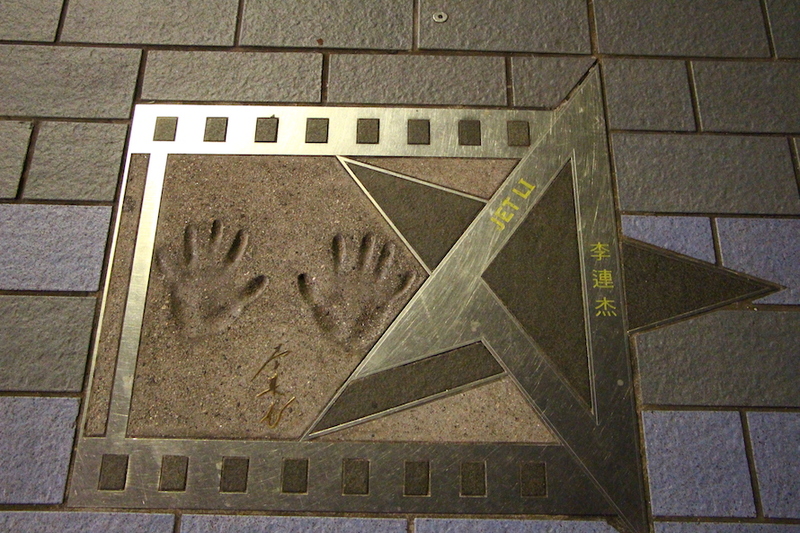 Also located in Tsim Sha Sui is Avenue of Stars, a stretch of walkway analogous to Hollywood Walk of Fame. 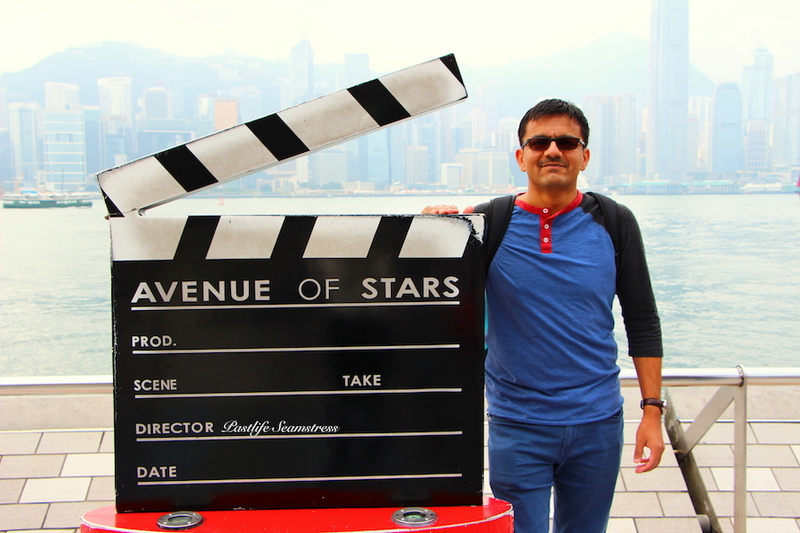 It’s a major tourist attraction of Hong Kong and rather fun place to be – more so if you are a movie buff like us. Be here at night and you’ll not only be walking under the stars but also looking down to find them. 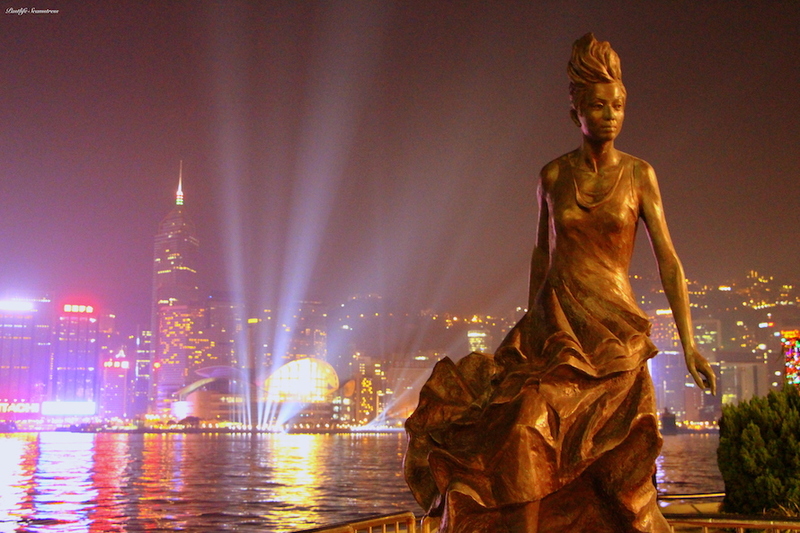 The bronze statues of Asia’s most famous stars look even more dramatic at night. It’s a pretty touristy thing to do but fun it is! As I’ve come to know it is currently closed for renovation till 2019…might wanna wait. 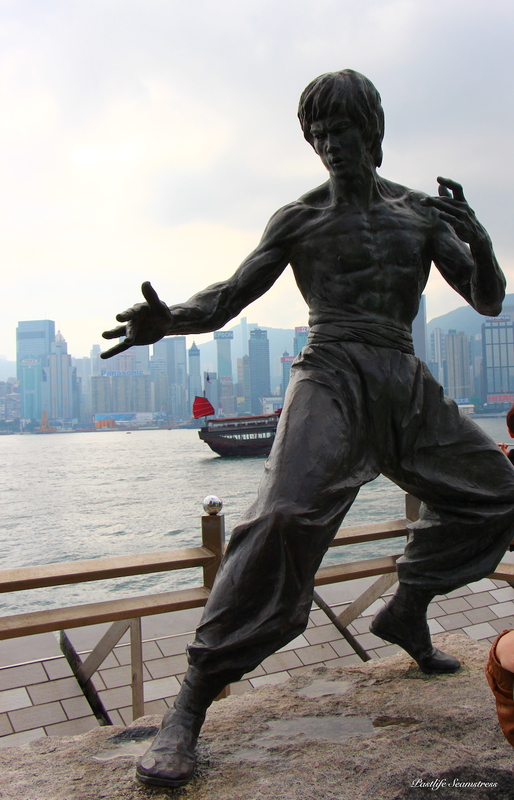 Statue of Bruce Lee, one of the most famous Asian stars across the world. Another one of easily recognised names on the five pointed stars glittering on the Avenue. Anita Mui, a famous canto pop star, resplendent in the Symphony of Lights. It was after dinner that we strolled on Avenue of Stars and had the place all to ourselves and as you can see I had been thoroughly entertained! 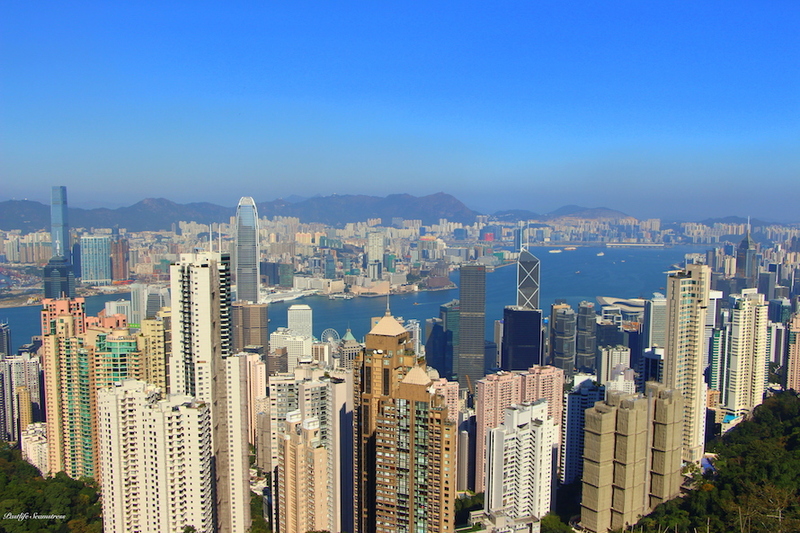 Victoria Peak is actually Mount Austin locally and popularly known as ‘The Peak’. 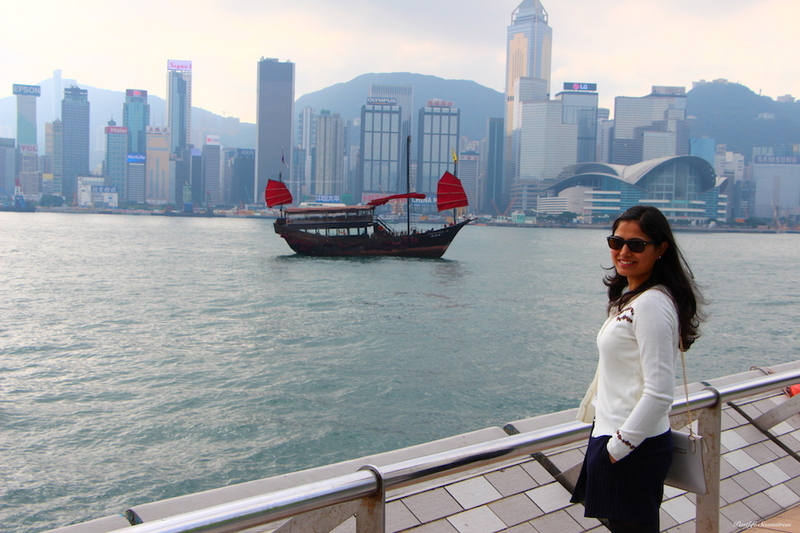 It is the highest point in Hong Kong Island with a bird’s eye view of the city and its surrounding islands. A glistening and stately looking Peak Tram (funicular) takes you up to the peak. However, the queues during holiday season or weekends can be painfully long. Buying online tickets could be your saviour but if you’d like to see and decide to go up on a better (Read: sunny and clear) day you’d might want to buy them in person which again could be agonising as was the case with us. And once you go through a not-so-fun journey, you’d at least want the destination to bowl you over if not supercalifragilisticexpialidocious! The official site for The Peak is here. Alternatively, the less advertised paved Peak Circular Path is an option if you are willing to use muscle power and go crowd and cost free. It takes about an hour to walk all the way up and the views are comparable. View of Hong Kong city and waterfront from The Peak. In hindsight, I think a better time would be to go close to sunset and be there till the lights come up. A beautiful red and vintage looking tram is sure a sight but if only you could get a good glimpse without getting knocked over. In addition to the option of dining and shopping, a peek into the Peak Tram Historical Gallery rounds off pretty much what you could do up there. 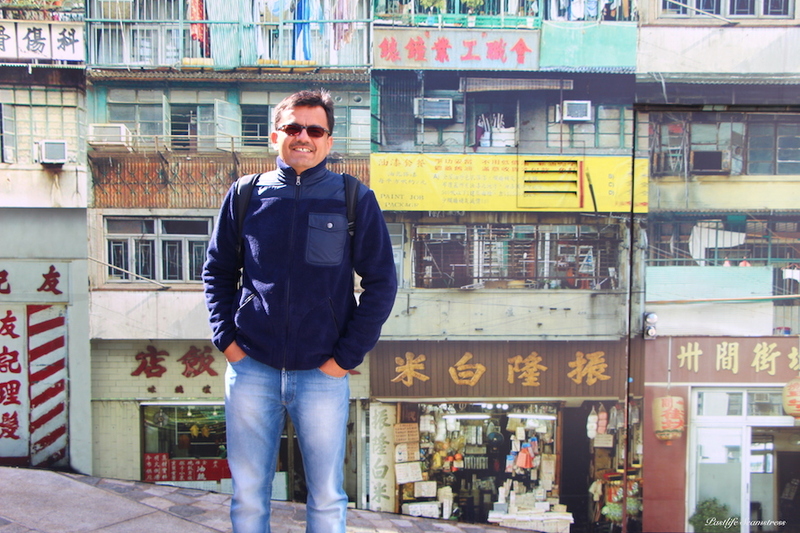 With this installation of Hong Kong’s local lanes and streets, The Peak, managed to get a taste of Hong Kong up there. Not a bad deal, eh? 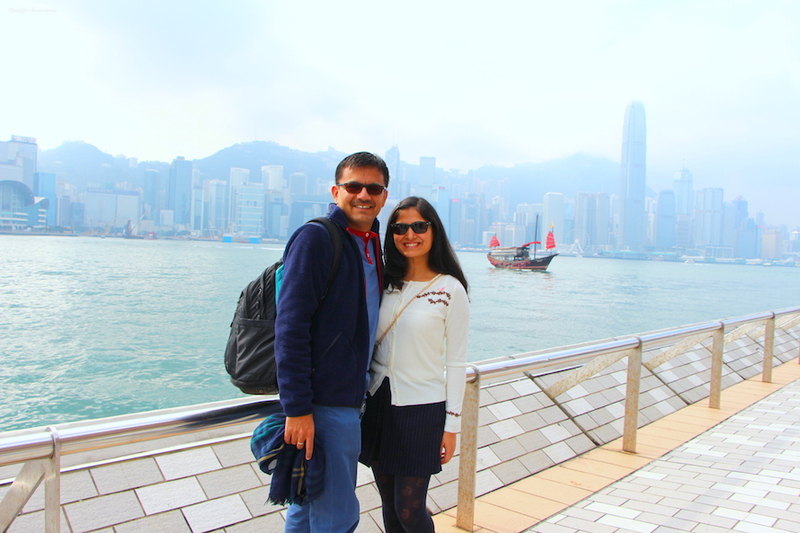 We saw Hong Kong in two parts – once while going to Bali and again while coming from Bali stopping over to fly back home. During our second stint we decided to forgo any city madness and went to quieter and more traditional parts that we often find ourselves usually gravitating towards. So much for our ‘big city’ escapism! 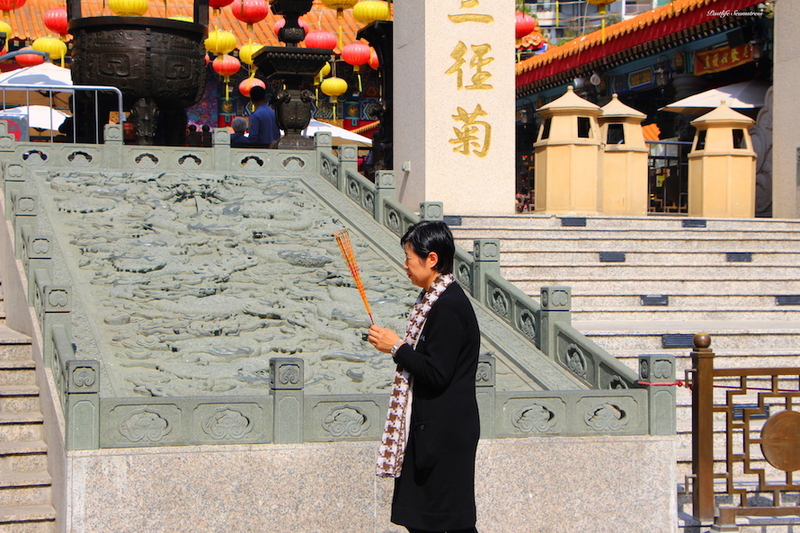 Home to three religions (Taoism, Buddhism and Confucianism), believed to bring luck and answer prayers – this temple is definitely the most famous in Hong Kong. 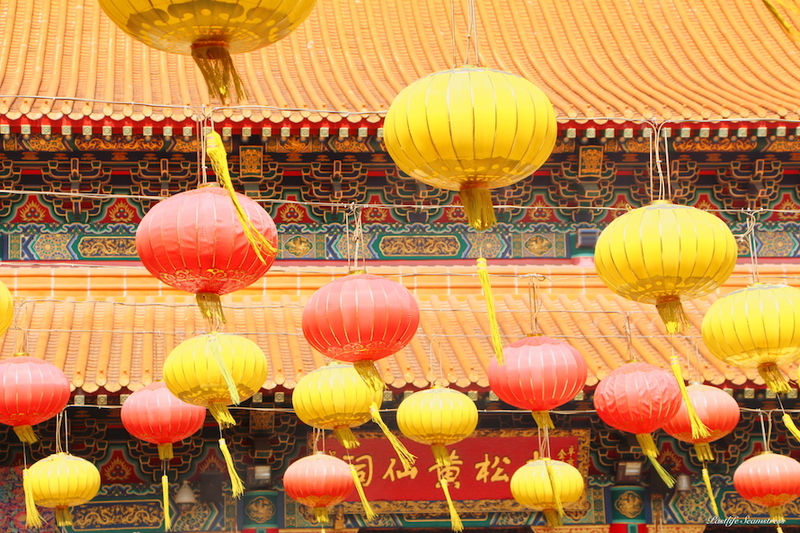 A classical Chinese building with red pillars, lattice-work and dragon carvings is something special to look at. Wong Tai Sin Temple with Chinese Lanterns swaying in gentle breeze. A good rub for good luck? 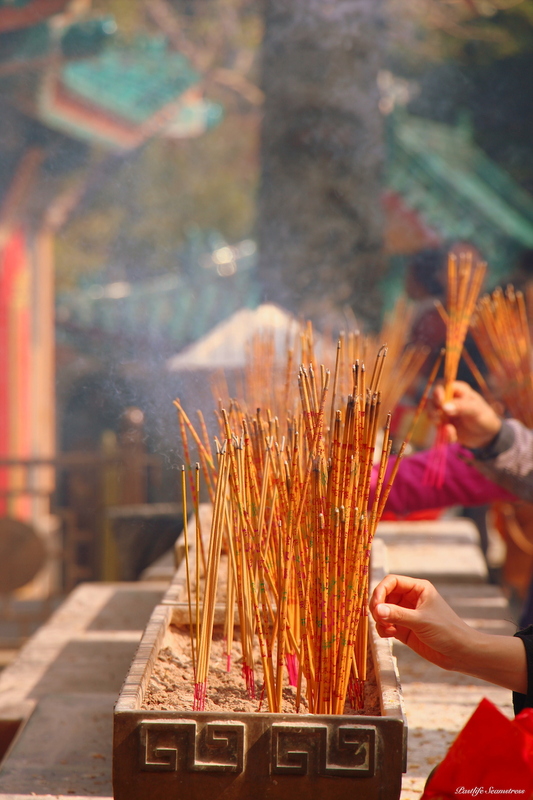 Incense burning is a common practice in many Asian religions. We visited this temple during morning hours and found it to be fairly busy at the time of the day. But it is normal to find it quite busy shortly after New Year’s day. At last! One peaceful haven in Hong Kong (Kowloon side). 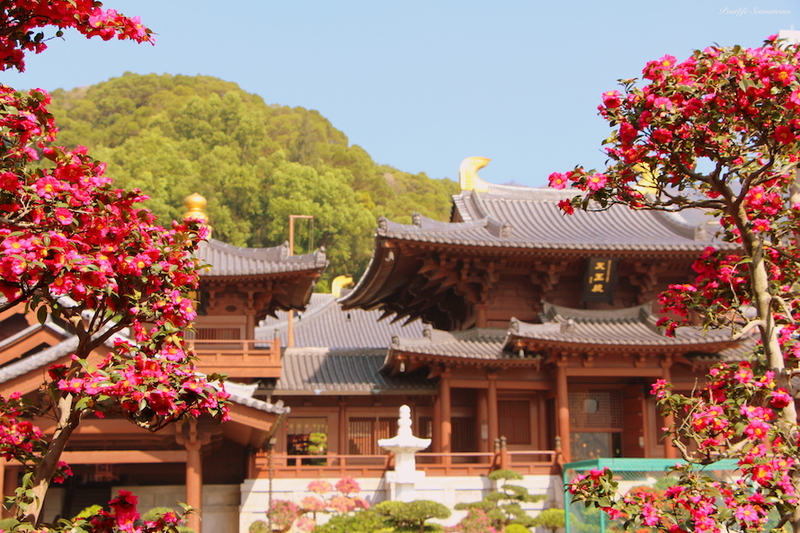 Chi Lin Nunnery is a large Buddhist temple complex built in architectural style of Tang Dynasty. 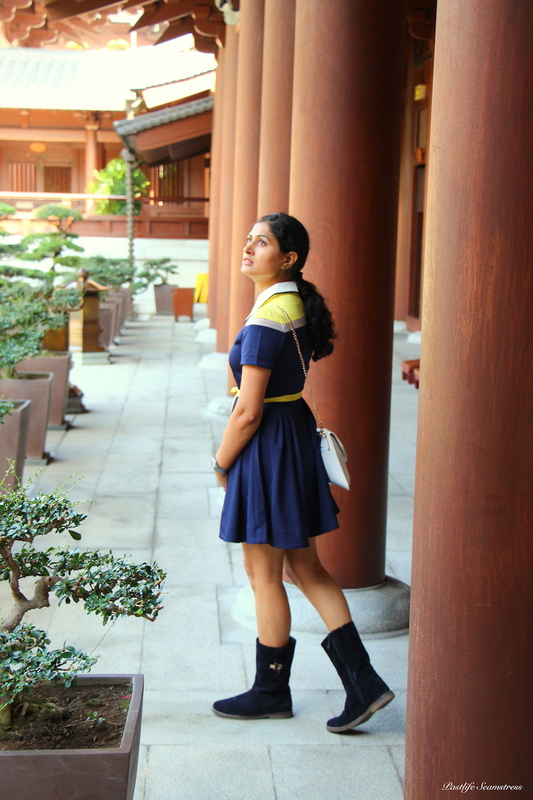 Chi Lin Nunnery was nothing but soothing to senses, just about what was needed to wrap up our time in Hong Kong. Almost completely devoid of visitors, it made for a great decamp from the city buzz which, ironically, was what we sought at the outset of this adventure. 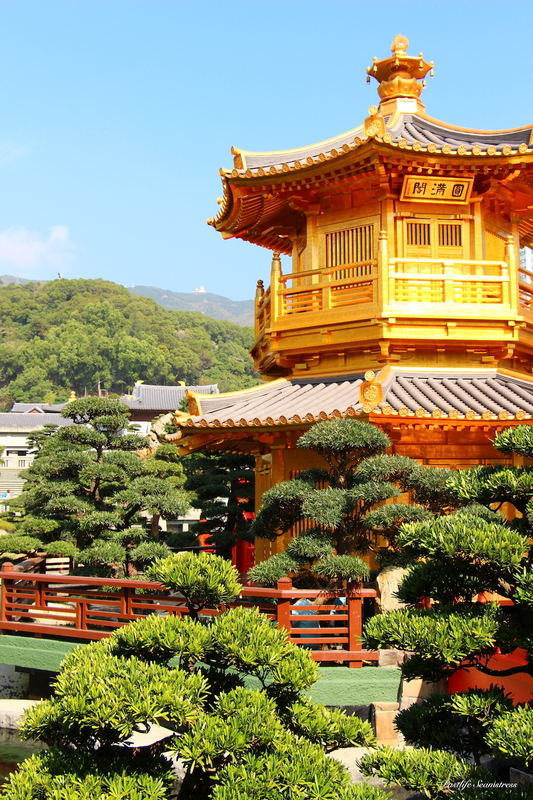 Chi Lin Nunnery is one fascinating piece of architecture being made entirely of Cypress wood. Beautiful, tranquil AND the largest handmade wooden structure in the world!! The temple halls of the nunnery has Buddha statues made of gold, stone, wood and clay and is open to visitors on all days. It also has a large Chinese garden dotted with lotus ponds and wooden bridges. Also open to public and worth a visit. It’s a residential complex (also called as the Monster Building) in Hong Kong. What?! A building??  Yeah, thats pretty much what it is but it is the most ‘instagrammable’ site in all of Hong Kong these days. Sort of a taller, larger, higher counter part of a typical Mumbai chawl. Go ahead, get your money shot! It is truly something to look at. Cities like Hong Kong cater to all kinds of travellers (remember a commercial’s tag line – ‘there’s something for everyone’ – quite like that) the sightseers, the shoppers, fitness enthusiasts and to some extent even the recluse. Best of all – to the ‘foodies’. Food scene is always big and at its best when it comes to Hong Kong, whether its food with a few Michelin stars or food with a view or food with a long line of tradition backing it. Unfortunately, we are not very adventurous when its comes to food  Our experiments revolve around a few favourite cuisines and being vegetarians limit the options but because it is Hong Kong, I do have some good suggestions despite following a circumscribed diet. 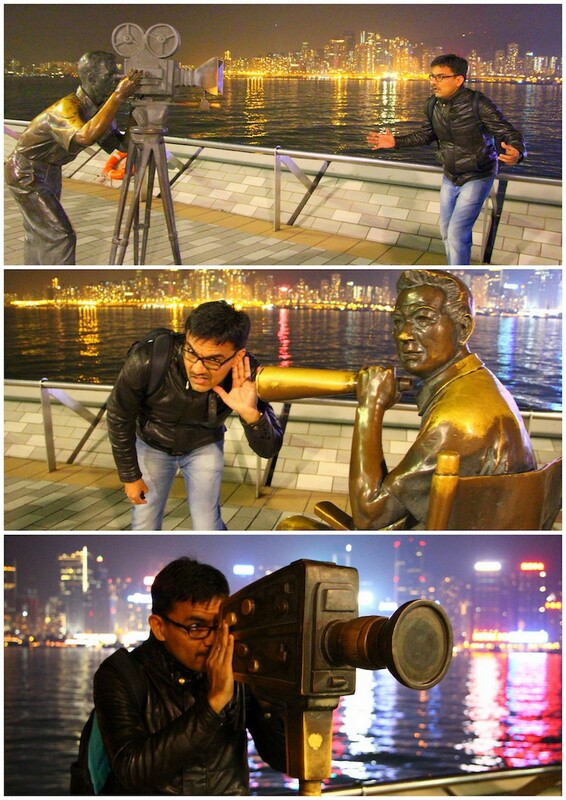 Namo – Avant Thai : Not just good food but always with a view of Victoria Harbour. Brain child of a Michelin Star Chef and a renowned Thai chef – you can’t go wrong with it! This mid-range place is conveniently located right next door to Shangri La, where we stayed for all of our time in Hong Kong. You cannot go to Hong Kong and not have Dim Sum (Steamed or fried dumplings with a variety of fillings)! So why not at a Michelin Star place? And no it won’t burn a hole in your pocket or require you to suit up. Tim Ho Wan (Sham Sui Po area) happens to be a casual dim sum parlour and cheapest Michelin Star restaurant in the world – all the reasons to give it a go. Another place that comes with strong recommendation is Chilli Fagara – a Sichuan Chinese restaurant that has great ambience and food. MUST try. Whenever there’s a good Indian restaurant we always try it. Here we loved Bombay Dreams. 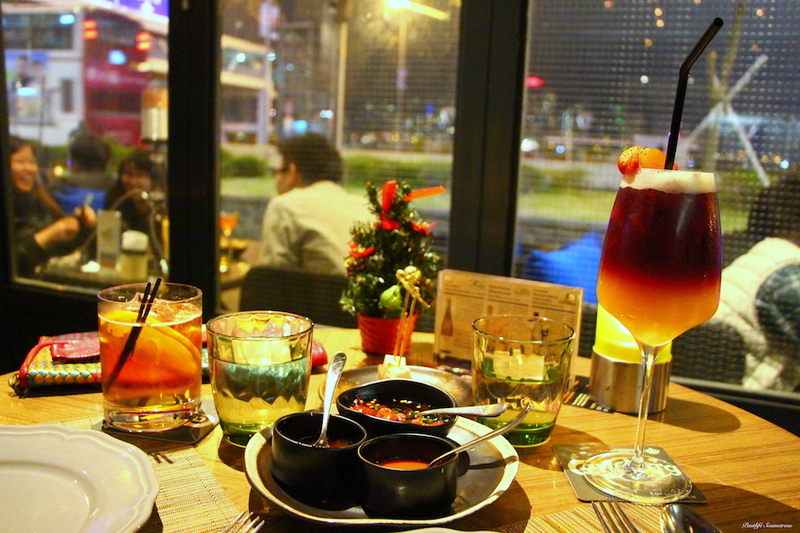 Lan Kwai Fong (popularly LKF) is a expat hot spot for wining, dining and clubbing. They say, food options here are as varied as the crowd it attracts with Malay, Thai, Indian cuisines and Pho restaurants on offer. An after hour haunt of city suits and high heels, where the buzz gets bigger by the hour. If you are into clean eating (low salt, low oil, no MSG etc ) you might want to try Chi Lin Vegetarian – as goes the name, a vegetarian restaurant offering delicacies of Chinese cuisine. Also as goes the name, it is close to Chi Lin Nunnery. You can savour a lot of Chinese dishes without worrying about what might have gone into that! And if you (and your purse strings) are up for it you can enjoy Posh Nosh at none other than The Peninsula. I’ve inserted a link to all the eateries – could be helpful when making reservations or for looking at menus. If you ask me, an entire trip can be consumed by shopping and eating when in Hong Kong. 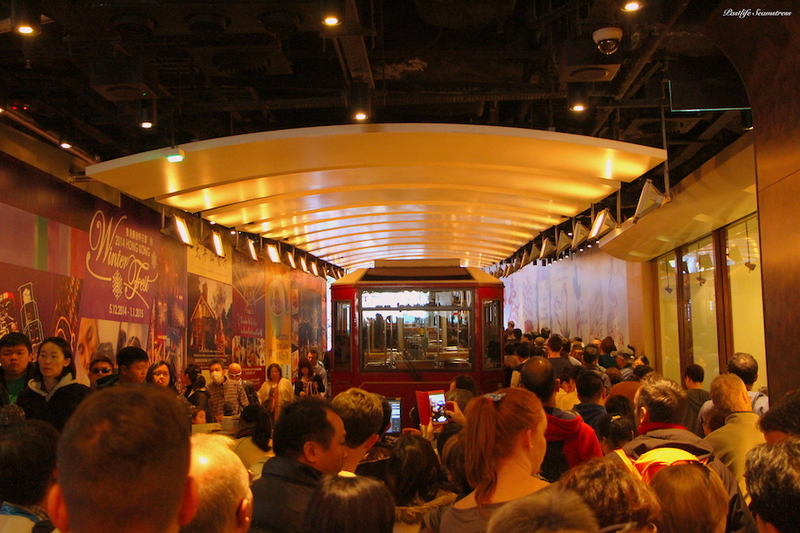 For luxury shoppers – there’s Times Square mall at Causeway bay which, blimey, was so crowded – I’ve never in my travel history seen such queues at any big designer stores as I saw here! 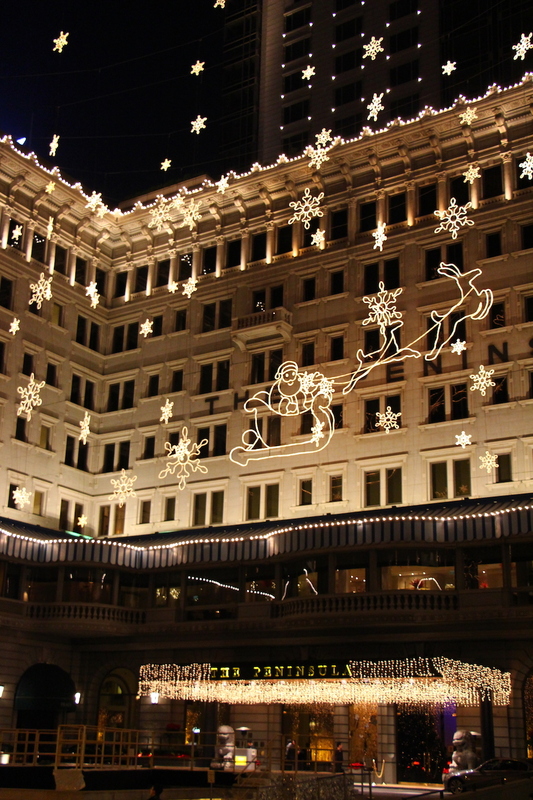 Then there’s Nathan Road which is known as the ‘golden mile’ for shopping. Landmark is another area for both high end as well as high street brands – so so many that you better have a plan to go about it! 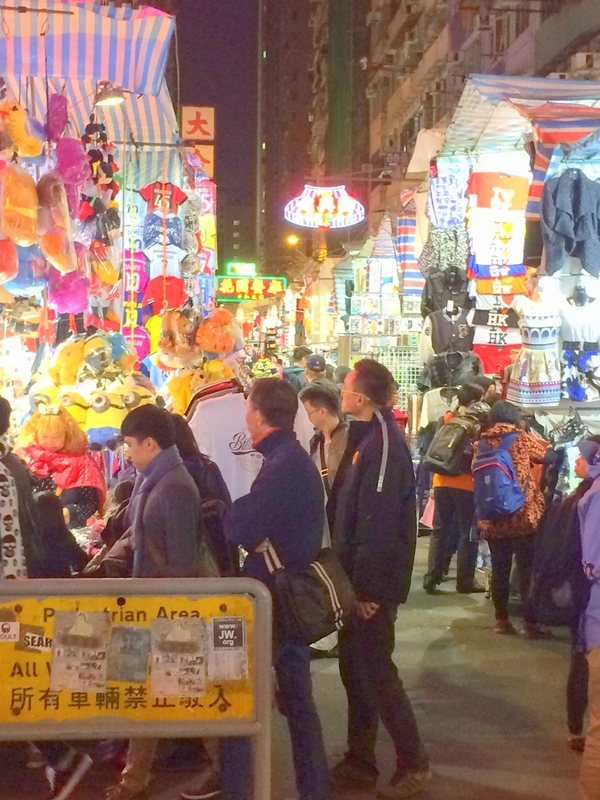 For bargain hunters Mongkok Ladies market sets its stalls out at 11 am up until midnight. Basically a market of counterfeits that aren’t any cheaper either. Selling ‘fakes’ of everything from shoes to clothes and what not from decorative tid – bits to the unmentionables and real live birds – it’s an amusing place to go around at night. However, when it comes to bargaining the shop keepers can be pretty rude, off handed and a tough lot to haggle with 廊! Better navigated as an open air museum rather than a shopping destination. However, out of the ocean of brands and local products in Hong Kong I did find a shop to recommend and its called G.O.D (Goods of Desire) a store dealing with small interior decor and quirky casual apparel for men, women and kids. 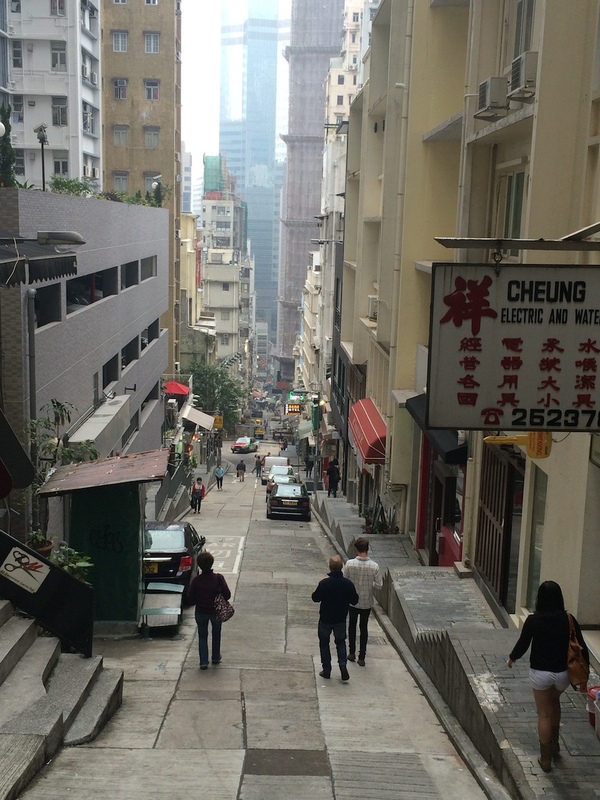 A nondescript street close to the mid level escalators – the world’d longest covered escalator system. Filming place of timeless classic Chungking Express. We travelled to Hong Kong in 2014-2015 and this was all that we could fit in to our short stoppage. Had we got more time or enthusiasm we’d have very much like to visit the Tian Tan Buddha or Big Buddha as is called. Besides this, we considered going to Macau (Vegas of China) which could have made for a day trip (and requires one to carry passport) but never made it. Travellers with kids have Disneyland and Ocean Park to head to and those seeking ‘me’ time can spread a mat at Shek O beach and dive into a book. If you want to break a sweat even on a holiday (or perhaps that does define a holiday for you) you can find a lot of hiking trails in and around Hong Kong. AND if shopping is your raison d’être you should be googling Shenzhen (right after you finish reading this – I’m about to finish). Hong Kong is mostly done on foot and by MTR (Mass transit railway) – which can be quite packed during office hours. However, the taxis in Hong Kong aren’t expensive either. However, if you ask me, cities are best seen and savoured on foot. 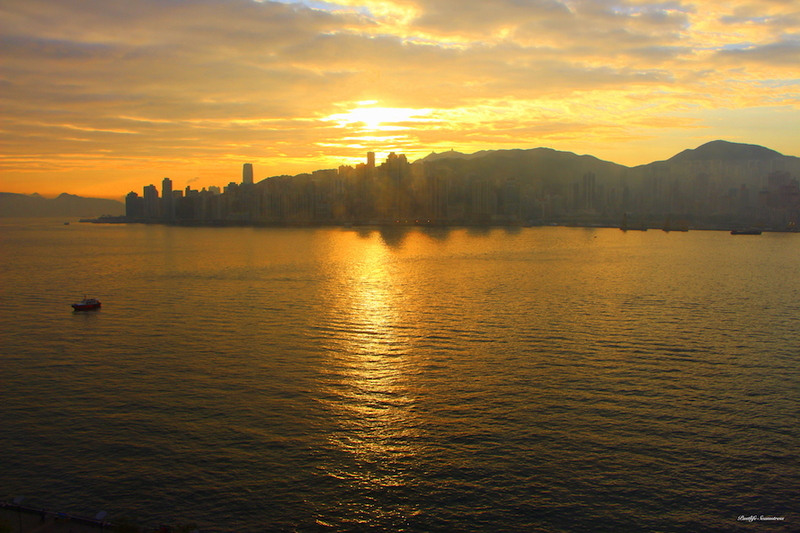 All this makes Hong Kong a well rounded destination for all kinds of travellers. That’s all folks! See you in Bali. From a last evening in Hong Kong.